Today’s Buy With Me 3/28: $24 gets you four AMC Silver Experience™ tickets to any AMC® theatre location (up to $52 value). I know I love taking my family to the movies but nowadays it is a HUGE expense! Today’s Buy With Me makes it affordable enough for the whole family to go to the movies, or better yet…TWO date nights for the price of one! 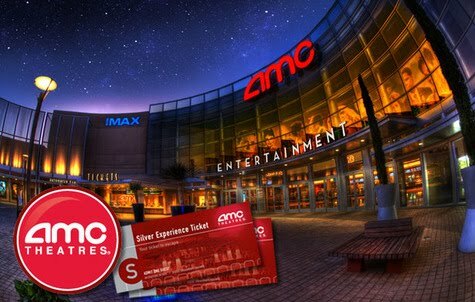 For $24, you get four AMC Silver Experience™ tickets to any AMC® theatre location (up to $52 value). The best part about this deal is that these tickets never expire! Hmmm…these would make great Easter gifts or basket stuffers! •Limit 1 voucher per person. •Your tickets will be mailed to the address you provide at BWM checkout within 7-10 business days; all shipping and processing fees are included. •Tickets are eligible for any AMC®, but shipping is only available to RI, NH, NJ, NY, CT, MA, DC, VA, TX, WA, CA, AZ, IL, WI, PA, MD, GA.
•Once you receive your tickets in the mail, they can be redeemed for admission at any AMC Theatres® location; not valid for online or kiosk purchasing, or reserved seating. •Good at any AMC®, AMC Showplace, Loews®, Cineplex Odeon, Magic Johnson, and Star theatres, excluding Canadian theatres. •Not valid for special engagements. •Valid only for movies that are two weeks out from their original release date. •Extra charges may apply for 3D, IMAX®, ETX, alternative content, and premium services and locations. •Shows and seating subject to availability. •No age restriction to redeem, but movies are subject to MPAA age restrictions, based on MPAA rating. •Movie ticket photocopies are not allowed. •Movie tickets have no cash value and are not valid for cash back. •AMC Theatres® movie tickets do not expire.